Happy Monday, friends! Today, you are in for a real treat! Amber at Follow the Yellow Brick Home is hosting a vintage garden tour. Several talented bloggers will be sharing their gardens and porches decorated with lots of vintage charm. If you are visiting from Art and Sand, I am so happy that you stopped by! Before, I share some of my garden with you, join me on the back porch for some pink lemonade and lemon cupcakes. To add a vintage touch to my back porch, I placed Dragon Wing Begonias in antique olive buckets. I love pops of color and found these new outdoor pillows at Homegoods. A vintage watering can propped on an antique book adds another touch of old world charm. Perched upon a blue and white garden stool is a piece of Depression Glass filled with limes. Now let’s take a look at some of my flower beds. Our house is situated in an area with lots of mature trees. Therefore, the majority of our plants and flowers have to be shade tolerant. That can really limit what we are allowed to grow. We have lots of azaleas that bloom in the spring. We also have some that are ever blooming. However, we had a really late freeze this year, and most of our azaleas lost their blooms. We planted lots of Caladiums and Impatiens. They love the shade! You will find Impatien borders in both my front and back yard areas. The weathered statue helps to reinforce a vintage look to the garden. Coleus is another shade loving plant that does well in my flowerbeds. I am so happy that you stopped by for a visit! Up next on the tour is Jann at Have a Daily Cup of Mrs Olson. Be sure to visit the other bloggers on the tour. A schedule is posted below. 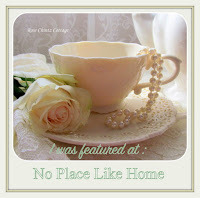 Also, there is an Alfresco Tablescape Blog Hop going on this week. A schedule for this event is also posted below. I will be featuring my tablescape on Thursday. Enjoy your day, sweet friends!!! So delightful, Shannon! I love your impatiens, coleus and caladiums in your garden. I also have a shade garden and I’ve had white caladiums and white impatiens for a few years. I might add some pink next year, That is the cutest bunny holding a basket of greens. .Your really have a flare for decorating.Have a wonderful week. Bonnie, you are so sweet! Thank you for your kind words. I was lucky that the previous home owners left the bunny behind. Enjoy your week, sweet friend!!! Your gardens are beautiful. The rabbit made me smile. Thank you Penny! I was lucky that the previous home owners left the rabbit behind! Enjoy your week!!! Shannon, I would love to join you for lemonade and cupcakes.on your lovely patio. Your shade garden is beautiful with impatiens, coleus, and caladiums. Your home is so charming and you have done a marvelous job decorating. Have a wonderful day sweet friend! Thank you, sweet friend! Happy Tuesday!!! Thank you so much, Cecilia! It was so much fun being on the tour with you! Enjoy your week!!! Shannon, I love your outdoor seating area. The lemonade and lemon cupcakes made my mouth water! It looks like the perfect spot to enjoy a lazy afteroon. And your Caladiums and Impatiens border around the tree is simply gorgeous. So happy to be on the hop with you! Thank you, Michelle! It was so much fun being on the tour with you! Enjoy your week!!! Beautiful! I love your style. I could spend the day on your welcoming patio and in your gorgeous garden. What color did you pain your door and shutters? It’s such a relaxing color? Thank you, Connie, for your very sweet comment! The previous home owner chose the blue color, and we took a sample and had some more paint mixed. I have the codes and can send you a picture of the label. If you would like email me through my info, and I’ll send you a screen shot of the label. So beautiful, Shannon! The mature trees provide the most amazing backdrop for plants. Caladiums and impatiens are two of my favorites. Your patio is amazing too! How nice to sit out there in the summer…..well, maybe not the past few days. I heard it was hotter in Oklahoma than here in Texas! Thank you, Stacey, for the sweet comment! It was so much fun being on the tour with you! Enjoy your week!!! Shannon, your outdoor area is lovely and how I would enjoy those cupcakes and lemonade. Perfect for a summer day. Now, let’s talk about your gorgeous garden. Oh, those impatiens are stunning with the caladiums and coleus. And the color is fabulous! You have not only created something for you and your family to enjoy, everyone who passes your lovely home will enjoy the beauty as well. Thank you, sweet friend! Enjoy your day!!! Adorable pictures!!! I wish my English would be better so I could describe in details how I am loving this great garden party…Congratulations to all of you,ladies! Thank you, Maristella, for your very sweet comment! I hope that enjoy your week!!! Shannon, I love shady gardens. Impatiens and Begonias are always so beautiful! Love your little rabbit. Thank you, Jann! Enjoy your week!!! Oh I have impatient and caladium envy! Your garden is just splendid. The rabbit statuary has captured my heart. Thank you, Laura! It was so much fun being on the tour with you! Enjoy your week!!! Oh so pretty! Loved the tour. And totally jealous of your green thumb! Thank you, Cindy! It was so much fun being on the tour with you! Enjoy your week!!! You garden is so pretty! I love your porch and the pops of color from the pillows. Your plants are thriving and look so healthy. Adore the bunny statue! Thank you, Angelina! I hope that you have a wonderful day!!! Shannon, I LOVE caladiums! If my trees ever get to the point where my garden is anything other than full or mostly full sun, they will be on my list. Your flower beds are beautiful. Your porch styling is exactly as you intended, too, with great pops of color. Lovely! Thank you, Rita, for your sweet words! It was so much fun being on the tour with you! Enjoy your week!!! Thank you so much, Marilyn, for your very sweet words! I am so happy that you stopped by for a visit! I hope that you enjoy your week!!! Thank you, Lora! Enjoy your week!!! Such a pretty tour! I want to come over for some lemonade and cupcakes! I think your new pillows look fabulous and that rug is amazing! Your impatiens look so pretty in a border under your trees!! Love touring with you! Thank you, Kristin, for your very sweet words! It was so much fun being on the tour with you! Enjoy your week!!! Your garden is lovely! I need to look for caladiums to add to a spot in my garden with impatiens. Thanks for the idea. Thank you, Carol, for the sweet comment! I hope that you have a wonderful week!!! Thank you so much, Jenna! Enjoy your week!!! What a beautiful setting for a relaxing afternoon! Thank you, Kippi! Enjoy your week!!! Your yard and garden are all so inviting! Thank you, Donna, for your sweet comment! I hope that you have a wonderful week!!! Your garden and outdoor living space is lovely!! Thanks so much for sharing!! Thank you, Debbie! Enjoy your week!!! What stunning gardens you have and your back patio is such a delight! Shannon, I thoroughly enjoyed my revisit to your beautiful garden. And if I could just pull that beautiful pitcher of pink lemonade and those yummy cupcakes through my screen, I would be a happy girl. As always, a beautiful post. Have a wonderful week, sweet friend! Shannon, I enjoyed this visit as much as the first. I would love a glass of pink lemonade and a lemon cupcake, please. Thanks for sharing at Gardens Galore and Happy Tuesday! Thank you so much sweet friend and thanks for hosting. I always love your garden parties. It is amazing at all of the gardening talent in blog land! The Caladiums looks so pretty with the pink impatiens! I have to remember that for next year. Loved all your pictures. Thank you so much, AnnMarie! I hope that you have a wonderful week!! !